Each year, young people from around the world go to Silicon Valley to hatch an idea, start a company, strike it rich, and become powerful and famous. 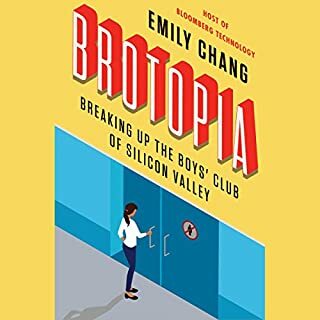 In The Valley of the Gods, Wolfe follows three of these upstarts who have "stopped out" of college and real life to live and work in Silicon Valley in the hopes of becoming the next Mark Zuckerberg or Elon Musk. No one has yet documented the battle for the brightest kids, kids whose goals are no less than making billions of dollars - and the fight they wage in turn to make it there. 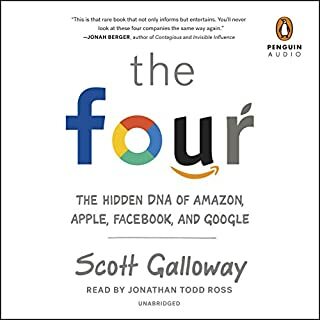 The richly told narrative of the Silicon Valley generation that launched five major high-tech industries in seven years, laying the foundation for today's technology-driven world. 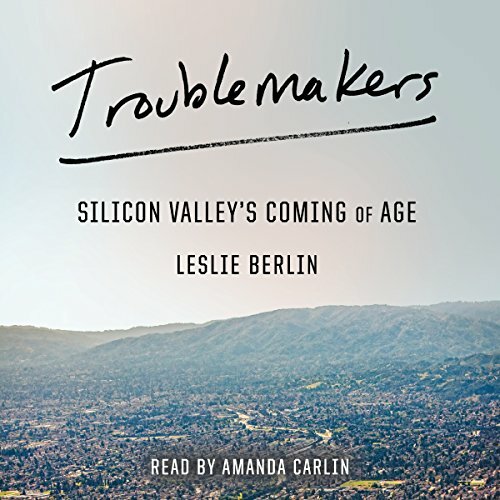 In Troublemakers, historian Leslie Berlin introduces the people and stories behind the birth of the Internet and the microprocessor as well as Apple, Atari, Genentech, Xerox PARC, ROLM, ASK, and the iconic venture capital firms Sequoia Capital and Kleiner Perkins Caufield & Byers. In the space of only seven years and 35 miles, five major industries - personal computing, video games, biotechnology, modern venture capital, and advanced semiconductor logic - were born. During these same years, the first Arpanet transmission came into a Stanford lab, the university began licensing faculty innovations to businesses, and the Silicon Valley tech community began mobilizing to develop the lobbying clout and influence that have become critical components of modern American politics. In other words these were the years when one of the most powerful pillars of our modern innovation and political systems was first erected. Featured among well-known Silicon Valley innovators like Steve Jobs, Regis McKenna, Larry Ellison, and Don Valentine are Mike Markkula, the underappreciated chairman of Apple who owned one-third of the company; Bob Taylor, who kick-started the Arpanet and masterminded the personal computer; software entrepreneur Sandra Kurtzig, the first woman to take a technology company public; Bob Swanson, the cofounder of Genentech; Al Alcorn, the Atari engineer behind the first wildly successful video game; Fawn Alvarez, who rose from an assembler on a factory line to the executive suite; and Niels Reimers, the Stanford administrator who changed how university innovations reach the public. Together these troublemakers rewrote the rules and invented the future. Where does Troublemakers rank among all the audiobooks you’ve listened to so far? Most annoying book I've ever listened to. What was one of the most memorable moments of Troublemakers? Realizing the book was being read by a robot. A pretty good one, but a robot none the less. Have you ever wanted to have Julie from Amtrak read you a book? If so, buy this book! If not, and if you'll be distracted by the odd inflections, weird little pauses and always slightly out of sync feeling of text to speech conversion, avoid this title. Well, I listened to as much of it as I'm ever going to listen to in one setting. All of about 15 minutes worth of it to be exact. I kept hoping maybe it was a joke. "Hey, did you realize that the intro was read by a computer? Ain't science wonderful? Now here's a real person to read the book!" Sadly, that's not what happened. Hire a human and record the book again. It is very clear from the tonality, and many sound elements, that the book is being narrated by a text-to-speech engine, and not a very good one at that (I have validated my impressions with software developers involved in the field, in addition to my own experience). I can't listen to 16.5 hours of this. Audible: do not allow text-to-speech in your catalogue please. When we buy an Audible title it is to have the satisfaction of having it read by a human with the sensibilities of a human. If we want text-to-speech we can just buy the Kindle version and have it narrated using the operating system's text-to-speech narration service for the visually impaired. I understand that having automated narration is much cheaper to produce, but also understand that the value of the end product is also much, much, much lower. I hope this is not an indication of things to come. This is the book I was so looking forward to for months. I have both the physical book and the audio book. And I’m not disappointed with the book itself. But the narration? It’s so bad that this is the first time I’m writing a review because of the horrible narration. Weak and very unstable voice. 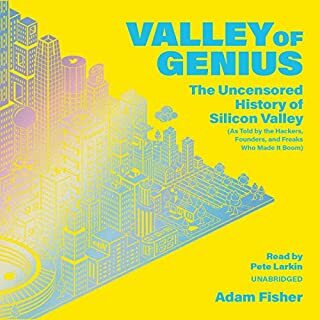 A great book about the early days in Silicon Valley spoiled by a narrator who sounded like a robot, mispronounced names, and said "Silicone" instead of "Silicon." The book is actually pretty good, but couldn't stand more than a few minutes of the text-to-speech narration. It's sad to realize that Audible is now using TTS robots instead of human narrators. Sign of the times, I guess. 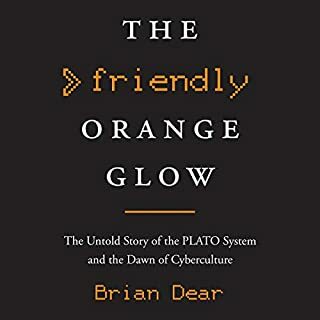 Do yourself a favor and get the Kindle or the dead tree version. First, this book is not read by a robot - it’s just read by a terrible reader who sounds like a robot. In either case it sounds like a robot - and isn’t very good. You can improve it somewhat by increasing the play speed to 1.25x - it makes it sound a bit better. But why would you want to do anything but hit stop on this book? If you’re a social justice warrior or a left wing nut job or someone that thinks history needs to meet sexual and racial quotas - this is the book for you. 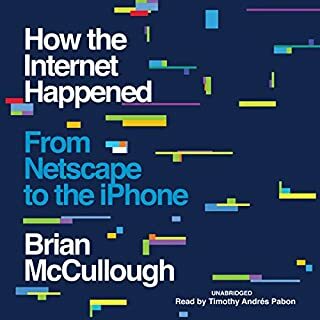 If you’re someone that came here to hear a story about the beginning of Silicon Valley and isn’t interested in the authors boring left wing political view - then you’ll probably want to skip this one. It really is a shame people can’t just write history books without injecting their own politics into everything. I don’t care if I agree or don’t agree, the book isn’t about the author, it’s about the subject - and clearly the author doesn’t get this entry level concept. Anywho I’d skip this as there are much better and more interesting books available on the subject - and you can get a much better readers as a bonus. But if you love robots and think ANTIFA is great - then this is for you. 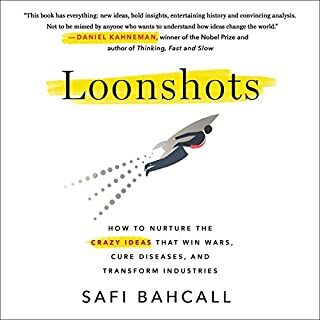 This book covers the lives of some lesser known Valley founding individuals and how the culture of Silicon Valley helps it continue to innovate. It focuses on short period of time and is a well written and researched history. For those of us from the old "smoke stack" industries, it is enlightening. I did not find the reader annoying, just lacking emotion. in order to know where you're going it might be nice to know where you've been yet at the same time the message in this book is clearly not to be locked into the past but to look forward into the future. For those of us who like to read in this area, this nicely written book fills in a few more details even for the most well-read aficionado. there's a lot of food for thought of this book. Great and compelling for us Baby boomers who lived through this era. Great story telling.